What is shaping changes in design forms? While designers themselves are contributing to the transition, Paul Peng, general manager of IAPA, believes "the invisible… more decisive hand of globalization" is at least as important an influence. Take Your Next Big Step. The Design to Lead Summit is the profession's only conference geared toward emerging leaders ready to take next step management roles. This year's Legislative Symposium includes our first-ever Hill Day, your chance to take Interior Design's message straight to lawmakers on Capitol Hill — we'll show you how! Advocate and Serve. Learn how leaders effectively represent their organization to stakeholders during Design to Lead; take part in the legislative process and advocate on behalf of the profession during Legislative Symposium. Expand Your Network. Make connections and engage with experts, thought leaders, peers, and legislators, all while elevating your place and role in the design community. Earn Your CEUs. You know you need them, and ASID offers the industry's premier educational programming. Earn .4 CEUs at the Legislative Symposium on topics that include building codes and standards and lighting design, and earn .4 CEUs at Design to Lead on topics that include strategic vision and leadership development. Join the tour of Whitman-Walker Health at the end of Design to Lead and receive another .1 CEUs. Attend Two Great Events for One Low Price. A combo ticket to attend both events is available for $375 (ASID members) and $525 (non-members) — that's more than a 25 percent savings! Bonus Reason: The Blossoms are Blooming. There's no better time to be in D.C. than April. Spring is in the air, and the cherry blossoms are in bloom. Register for Design to Lead Summit, April 13 in Washington, D.C.
Register for Legislative Symposium, April 14-15 in Washington, D.C. Better yet, register for both! Last week ASID responded to a blog in the Huffington Post on interior design licensure in Florida to correct the author's misinformation about professional licensure and mischaracterization of the interior design profession and ASID. Responses were given by both ASID CEO Randy Fiser and ASID member Sarah W. Colandro, ASID, LEED AP ID+C. "As the voice of the industry, the American Society of Interior Designers (ASID) supports interior design laws based on their track record of creating economic opportunity for tens of thousands of America's small business owners…" Read Fiser's full response. "Code impacted spaces are regulated by the Florida Board of Architecture and Interior Design and have been since well before the law for design professionals was passed… Before this law, interior designers could not work in commercial spaces without supervision from an architect or engineer. The passage of interior design licensure opened the profession to those already practicing as well as those wanting to practice." Read Colandro's full response. The High Point Market Authority (HPMA), in association with ASID and sponsored by Horchow, will present the popular Design Viewpoints Series, April 17-21 at the High Point Theatre. The series offers up to .4 continuing education units (CEUs) to those who attend, and all sessions are IDCEC-approved. Learn more. HPMA, in association with ASID, will offer two bonus seminars that are IDCEC-approved. Join ASID and Steve Nobel of NOBELINKS for an exclusive ASID Accelerate Studio event on April 30 in Charlotte. Developed with small business owners in mind, the workshop series is an investment in your business and provides proven tools and techniques for designers new to the profession and for those who are prepared to take their design businesses to the next level of professionalism and profit. The workshop series features six Interior Design Continuing Education Council (IDCEC) approved sessions that focus on topics to help interior designers build successful, sustainable businesses. Attendees can participate in the full-day program or choose sessions a la carte. Learn more and register today. Every practitioner member of ASID must participate in continuing education. This includes every active ASID member in the Allied, Professional, and Associate membership categories. If you joined ASID between June 1, 2014, and May 31, 2015, you must complete .5 CEUs (5 hours) by December 31, 2015. If you joined ASID before June 1, 2014, you must complete 1.0 CEUs (10 hours) by December 31, 2015. ASID returns to ICFF with an expanded educational program for industry professionals and a new Student Day program. Positioned on the show floor, the ASID Educational Series will bring together thought leaders and industry experts to present insightful content throughout ICFF. Sessions will appeal to a cross-section of design markets and will include topics on business practices, the impact of design on health and wellness, housing trends, biophilic design, materials, and more. Registered session attendees will earn 0.1 IDCEC-approved continuing education units (CEUs) per session. Register for the ASID Educational Series today. Attendees must register for ICFF separately. Whether you're a seasoned practitioner or in the early stages of your career, business savvy is essential to success. And there's no easier way to get it than through a special series of training courses now offered by ASID. Business Strategy Solutions was developed by business professional, author, and educator Steve Nobel of NOBELINKS. Four CEU-accredited courses, totaling .7 IDCEC CEUs, will guide you through the vital steps to building a successful business: setting your intentions, attracting clients, managing projects, and sustaining your practice. These online interactive courses provide the flexibility you need to work at your own pace, on your own time. And most importantly, you'll gain practical advice to implement immediately. Learn more and register for Business Strategy Solutions. Join ASID at Dwell on Design for more than 18 ASID education sessions, and use promo code ASID to save $10 on tickets — register today. Dwell on Design, curated by the editors of Dwell magazine, returns to Los Angeles May 29-31. This exciting event brings together the best products, services and thought leaders in modern design for a series of exhibitions, conversations, education, and more. Don't miss this event. As part of the IDBI survey that goes out monthly to 300 members, ASID Research and Knowledge Management has added one "bonus question" per month. The question for March was, "How much do you expect business to increase or decrease in 2015 compared to 2014?" Respondents' answers were overwhelmingly positive, with 70 percent expecting growth. More than half of the respondents reported that they expect to grow between five and 15 percent on a year-over-year basis. The most frequent expectation of 10 percent growth was registered by 13 percent of respondents, but expectations of 15, 20, and 25 percent all cracked double-digit scores. Seven percent of those surveyed expect to grow by 80-100 percent or more. "Overall this suggests a very promising year for the design industry and suggests that while the current spending on construction activities have tempered in recent months, ASID IDBI panelists are anticipating a turnaround in the coming months," according to Jack Kleinhenz, Ph.D., the Society's economist. Register for an ASID REGREEN Workshop near you this spring to learn how to provide environmentally-respectful interiors through design. The REGREEN Implementation Workshop is the nation's first and most comprehensive green residential remodeling program. Gain key information for both residential renovations and small commercial projects. Part of the REGREEN Trained™ certificate program, the workshop offers 0.8 HSW CEU (IDCEC), which can also be used for LEED CMP. Learn more and register. Where: Workshops are available in New York, Houston, and Honolulu, with more cities coming soon. Power of Generative Design on Display in D.C. The ASID Foundation recently sponsored the "Design for Health and Hope" education session at the National Building Museum that looked at how evidence-based and generative interior design principles are being put into practice at the new Community of Hope Conway Health and Resource Center in Washington, D.C. 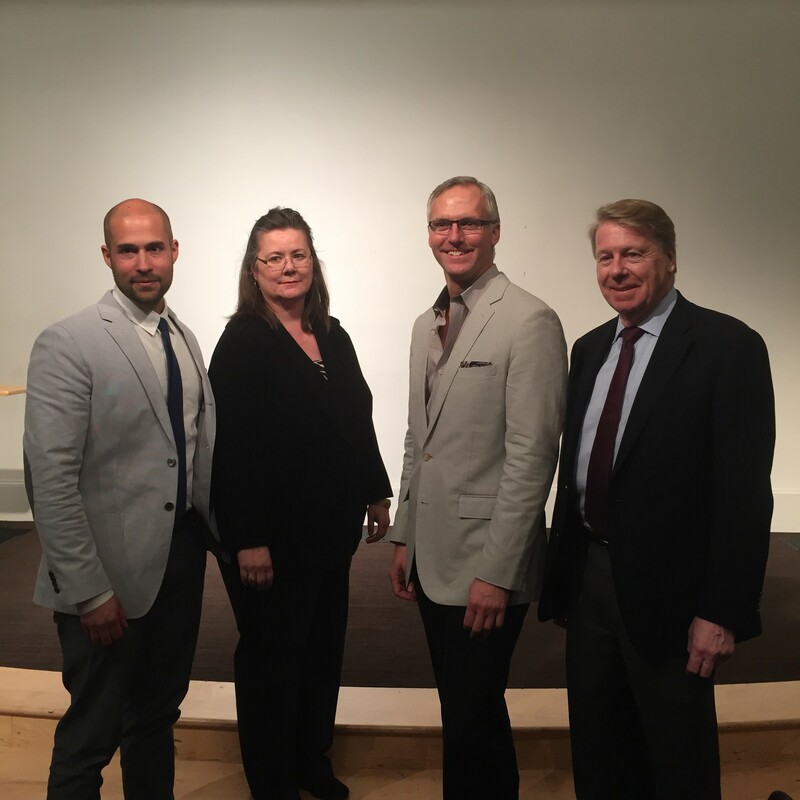 Speakers Tamara Cavin and David Cordell, ASID, with Perkins+Will, were designers on the project and discussed how the use of generative design was a key element in helping Center organizers better serve the homeless and underserved families in the community. "The impact of design is exponential," noted Cavin when discussing the positive economic and health impacts of the Center. Learn more about the Community of Hope and ASID education. The American Society of Interior Designers has announced four recipients of the 2015 ASID National Awards. This year's winners are Sonya Dufner, FASID, Designer of Distinction; William D. Browning, Hon. AIA, Design for Humanity; Wayne Ruga, FAIA, FIIDA, Hon. FASID, Design Innovation; and Lisa Marie Tucker, Ph.D., ASID, IDEC, Nancy Vincent McClelland Merit. Newly released reports from international property and construction consultants Rider Levett Bucknall show that construction costs are on the rise in the United States, as the construction industry itself has diminished in size since the recession that began in 2008. With costs of materials and labor gradually increasing, the demand for subcontractors "has led to upward pressure on bid prices in busy areas," said Julian Anderson, president of RLB. The older tranches of Gen Y are already moving out of urban cores and into the suburbs. The portion of Gen Y that's been living in urban cores is getting married and having children. They want to get married, be good parents, and send their kids to college. Living in urban cores is incompatible with that lifestyle for most of them. Using data to rationalize clients' questions gives designers an opportunity to gain additional trust within a client relationship, but implementing data within practice should not be considered a research endeavor. Data in practice is an opportunity to increase services and provide the firm with additional revenue. Pricing is the bane of the interior design industry. Take a look at any number of design websites and blogs, whether for consumers or professionals: Everyone is looking for, or handing out advice about, pricing. Clients worry about how much they should pay or will be charged for interior design services, and designers fret over how much they should charge or how much clients are willing to pay. It's a stumbling block that seems hard to avoid. As the professional in the conversation, you have to take the lead. Did you know one of the best, new successful strategies for signing up potential clients is to take your basic fee and offer additional fee and service choices for clients to choose from? It allows the client to choose "good" to start, and once comfortable, move into the "better" and "best" levels of your services. The "Good – Better – Best" method is also incredibly valuable for bigger remodeling projects. What's your default mode for judgments and decisions? To find out, take this (very short) cognitive-reflection test, which was created by Shane Frederick at Yale and originally appeared in The Journal of Economic Perspectives. In the first quarter of this year, many sources have commented on the changing demographics of the 2015+ client. The foundation of the new style is found in the shifting preferences of clients, as it relates to how rooms "feel." The impact of global experiences has resulted in palettes of unrestrained, complex combinations of patterns and materials, partnered with bold hues. From a concealed home office, to ultra-secure safe rooms, to in-ground storage, hidden rooms are a growing trend among custom homebuyers, who have realized this novel touch can be a clever way to increase wow factor and square footage. These concealed spaces can range from small storage compartments to full rooms with intricate entrances. What matters more in updating hardware — the shape or the finish? Are certain finishes more "on style" than others? Designers share their insights. Kyle Schuneman is a set designer and the small space designer for Bed Bath & Beyond and author of The First Apartment Book: Cool Design for Small Spaces. He offers insight on how to bring personality, depth, and individuality to even the smallest spaces. Carnegie Mellon University professor Vivian Loftness acknowledges that the role of women in the green building movement is a tough topic. Having spoken with many female professionals in green building across the U.S., Loftness has observed one similarity — each acknowledging a supportive partner. The National Association of Home Builders says a recent survey of prospective homebuyers shows energy-efficient homes are what they want most. Almost 84 percent of the people who responded to the survey said energy-efficient windows, Energy Star rated appliances, and programmable thermostats are high on the list of features they want in a new home. Others went further, saying they are looking for energy, water, and resource efficiency in a new home, together with improved indoor environmental quality from sustainable and locally sourced products. The U.S. Green Building Council announced it will now recognize energy and water requirements from the Living Building Challenge green building system within the LEED green building program. This move means projects achieving the energy and water requirements in the Living Building Challenge will be considered as technically equivalent to LEED. Big-city hotel rooms are about to get even smaller. Commune Hotels & Resorts, a San Francisco-based hotel group, is launching a new hotel brand that caters to guests who don't need spacious rooms — those who want to embrace "micro-living." Playing off the popularity of tiny house and micro-apartment living, Tommie hotels feature 160-square-foot guest rooms designed for travelers who don't plan on spending their vacation holed up inside. Good food is only half the recipe for success in a corporate cafeteria. Communal, well-designed cafeterias are rising in popularity as spaces that deliver ROI in the form of recruitment, branding, collaboration, and productivity. Evidence-based design research is largely associated with aspects of the built environment that support satisfaction and outcomes of the general patient population. But little information exists that's tied to the very specific segment of the population age 65 and older. The design team behind Yale-New Haven Hospital's new Center for Restorative Care set about to change that. Mobility is the rage in the workplace. Architects and designers are laying out workplaces that are free of offices and cubicles. Finance departments are happy to embrace the reduced cost of these environments. But, unlike the hens or turkeys that are content to spend their days away from a cage, the feeling among most workers is they are unhappy to be stripped of their walls and the shelter of their cubicles and tossed into the free-range office. This approach seems to ignore the fact that different workers have different jobs that require different conditions.